Cannabis in Washington relates to a number of legislative, legal, and cultural events surrounding the use of cannabis (marijuana,[a] hashish, THC, kief, etc.). On December 6, 2012, Washington became the first U.S. state to legalize recreational use of marijuana. [b] The state had previously legalized medical marijuana in 1998. Under state law, cannabis is legal for medical purposes and for any purpose by adults over 21. Washington was among many states to criminalize cannabis in the 1920s. The Washington State Legislature passed House Bill 3 in 1923, which defined “cannabis americana” and “cannabis indica” as narcotic drugs. Possession was punishable by one to 10 years in prison. Nevertheless, enforcement of the law was rare, as cannabis use was not common in the state. In western states such as Washington, cannabis prohibition was largely motivated by the drug’s association with the growing number of Mexican American immigrants. As racial and anti-immigrant tensions rose, newspapers published sensationalized stories of the drug causing Mexicans to go insane and commit violent crimes. Despite its Schedule I status, in 1979, the Washington Court of Appeals recognized there was a medical necessity defense for cannabis possession. In the case of State v. Diana, a Spokane man with multiple sclerosis appealed his conviction of possession of a controlled substance on the grounds that the drug was necessary to treat his medical condition. The court held that the medical defense exists, but only in very specific circumstances. Medical marijuana patients, however, had no legal way of obtaining the drug. In the 1990s, cannabis buyers clubs and cooperatives began providing the drug to patients in several cities across the US. These dispensaries operated in defiance of state and federal law, but were rarely targeted by law enforcement. In 1995, the Green Cross Patient Co-op of Bainbridge Island became the first buyers club in the country to be raided by law enforcement. The cooperative, run by Joanna McKee and Ronald L. (Stich) Miller, provided cannabis at little or no cost to over 70 patients with diseases such as AIDS, cancer, and multiple sclerosis. Both McKee and Miller were arrested, and around 130 cannabis plants were seized. The case was later dismissed when a Kitsap County judge ruled that the search warrant used to execute the raid was invalid. McKee and Miller moved the co-op to Seattle and resumed operations. In reaction to the raid against the Green Cross Patient Co-op, an attorney from Tacoma named Ralph Seeley sued the state of Washington, seeking to have cannabis rescheduled as a Schedule II drug. This would have allowed doctors to write prescriptions for medical marijuana. Seeley, who had been diagnosed with a rare bone cancer in 1986, used cannabis obtained from the co-op to treat the side effects of his chemotherapy. A Pierce County Superior Court judge ruled in Seeley’s favor, but the decision was overturned by the Washington Supreme Court by an 8-1 margin. Initiative 692 results by county, with number of votes shown by size, yes in green and no in orange. Following the ruling, two separate ballot initiatives were filed to decriminalize medical marijuana in the state. Both were sponsored by physician Rob Killian. Initiative 685, which appeared on the 1997 general ballot, would have allowed doctors to prescribe any Schedule I drug, if scientific research supported medical use. It would have also paroled drug prisoners. The initiative failed, with 60.4% of voters rejecting it. The following year, Initiative 692 was filed, which was limited only to decriminalizing medical marijuana. The initiative was endorsed by The Seattle Times, marking one of the first times a major newspaper in the U.S. backed a medical marijuana initiative. I-692 was approved by a margin of 59.0% to 41.0%. In April 2011, United States Attorney for the Eastern District of Washington Michael C. Ormsby ordered all dispensaries operating in Spokane to cease operations. Most complied, but several owners who refused to close their stores were arrested. Later that year, federal raids on medical marijuana dispensaries also occurred in western Washington. 15 dispensaries were targeted in cities including Seattle, Tacoma, Olympia, Puyallup, Lacey and Rochester. In spite of federal prohibition, public support in the state for marijuana reform continued to grow. In 2003, Seattle passed an initiative making adult marijuana possession the lowest priority of law enforcement agencies in the city. Tacoma passed a similar initiative in 2011. A 2010 poll by the University of Washington found that 52% of Washington voters supported removing criminal and civil penalties for marijuana possession. In early 2010, the Washington House of Representatives considered two bills regarding cannabis. One would have allowed cannabis sales in state liquor stores, and the other would have decriminalized possession of forty grams or less. Both bills died in committee. Cannabis activists responded by filing Initiative 1068, which would have removed all state-level criminal and civil penalties for cannabis use or possession by adults over the age of 18. Despite an endorsement by the Washington State Democratic Party, the campaign received little fundraising and failed to gather enough signatures to secure a spot on the ballot. Initiative 502 results by county, with number of votes shown by size, yes in green and no in orange. The following year, a separate group of activists filed Initiative 502, which would have legalized the use of cannabis for adults over the age of 21. The bill also allowed the Washington State Liquor Control Board to regulate and tax cannabis production and sales, and set new limits on blood THC (tetrahydrocannabinol) levels for driving under the influence. In December 2011, the initiative received enough signatures to be sent to the state legislature. In April 2012, when the legislature adjourned without acting, the initiative advanced to the 2012 general ballot. Early supporters of the measure included Seattle’s The Stranger and Spokane’s The Spokesman-Review. I-502 was also endorsed by the Washington State Democratic Party, the mayor and entire city council of Seattle, and the sheriff of King County. National support came from the National Organization for the Reform of Marijuana Laws (NORML), the NAACP, Law Enforcement Action Partnership (LEAP) and the American Civil Liberties Union (ACLU). The initiative faced little organized opposition. The most vocal opponents were medical marijuana advocates, who claimed the new DUI provisions were too strict and that recreational dispensaries would hurt the medical marijuana industry. Police groups such as the Washington Association of Sheriffs and Police Chiefs also opposed the initiative, but did little fundraising or campaigning against it. On November 6, 2012, I-502 was approved by a vote of 55.7% to 44.3% Possession of up to 1 ounce (28 g) of marijuana by adults became legal under state law on December 6, however cultivation, sale and even gifting remained illegal. Laws regarding medical marijuana remained unchanged. After I-502 went into effect, the Washington State Liquor Control board began establishing regulations for the new recreational cannabis industry, with a deadline of December 1, 2013 set by the initiative. In August 2013, the United States Department of Justice announced that it would not interfere with state-level legalization, as long as distribution and sales were strictly regulated by the state. On November 18, 2013, the state began accepting applications for marijuana businesses including growers, processors and retail outlets. The Liquor Control Board initially planned to allow 334 retail stores and 2,000,000 square feet (190,000 m2) of growing space statewide. The first recreational cannabis stores in Washington opened to the public on July 8, 2014. In accordance with the Federal 2014 Farm Bill, the state legislature passed ESSB 6206 in 2016, creating the Industrial Hemp Research Pilot (IHRP). The state’s first post-Prohibition hemp crop was planted at Moses Lake in 2017, and a total of 180 acres (73 ha) was planted that year. Even before the establishment of state-licensed growers and retail stores, cannabis was easily obtainable. Much of the state’s supply was grown locally or imported from the neighboring Canadian province of British Columbia or from Mexico. According to the Drug Enforcement Administration, the state was among the top five producers of indoor-grown cannabis in 1996, the last year the agency published estimated crop sizes by state. About 80% of the cannabis seized in the Seattle area was grown indoors. In 1998, NORML published a report claiming cannabis was Washington’s fifth most valuable cash crop. After the increase in security at the United States–Mexico border, due in part to the September 11 attacks of 2001, Mexican cartels increasingly began to grow cannabis within the United States rather than export it from Mexico. The cartels utilized the favorable climate of Eastern Washington to establish large scale outdoor-growing operations in remote areas of national parks and tribal reservations. In 2010, around 82,000 cannabis plants were seized on tribal lands in the state, accounting for almost a quarter of all plants seized by law enforcement that year. These clandestine growers cause significant damage to the environment by diverting streams, clearing trees, using pesticides, poaching animals and leaving behind litter and human waste. Although the state began regulating the cannabis industry in 2014, unlicensed production continued. In 2017, a drug bust organized by multiple counties seized over 33,000 cannabis plants which were suspected to be part of an illegal growing operation run by Chinese nationals. Washington’s legal cannabis industry is regulated by the state’s Liquor and Cannabis Board (formerly known as the Washington State Liquor Control Board). The state offers separate business licenses to cannabis growers, processors and retailers. Grower and processor licenses can be held simultaneously, but retailers cannot obtain either grower or processor licenses. :8 Growers may only legally sell cannabis to licensed processors or retailers—not directly to consumers. Unlike other states that have legalized recreational cannabis, Washington does not allow unlicensed cultivation for personal use. During the first 11 months of licensed retail sales, total sales amounted to US$260 million. :8 Sales increased to $486 million in 2015, and $1.1 billion in 2016; sales/excise tax revenue has risen in tandem, increasing from $65 million in 2015FY to $315 million in 2017FY. Retail sales are taxed at 37%, which accounts for the majority of the state’s marijuana tax revenue. The allocation of tax revenue was dictated by Initiative 502. The majority of the money goes towards public health programs such as Medicaid, community health centers and substance abuse prevention efforts. The remaining funds go towards the Liquor and Cannabis Board, local governments, and the state general fund. According to the Substance Abuse and Mental Health Services Administration, as of 2015–2016, 19.5% of Washington adults aged 18 or older have used cannabis within the past year, relative to the national average, which was estimated at 13.9% by the same survey. A 2016 survey by the Washington State Department of Health found that adolescent usage in the state has remained stable over the past decade despite the introduction of retail stores in 2014. According to Monitoring the Future, between 2010–2012 and 2014–2016, marijuana usage by eighth and 10th graders increased by 2.0% and 4.1% respectively. Both surveys found that the perceived harm associated with use has declined among adolescents since legalization. Since 1991, Washington has hosted the annual Seattle Hempfest, a protest festival which advocates the reform of cannabis laws. The event is held in Seattle city parks and features speakers (including politicians and activists) as well as live music. Attendance has grown from around 500 people in its first year to 200,000 at the 2003 festival. Following the passage of I-502, the event still draws over 100,000 attendees annually. 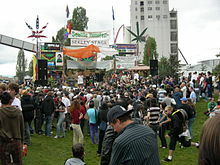 Olympia has also hosted a similar event beginning in 2004, the Olympia Hempfest. The Cannabis Farmers Market in Seattle was founded in 2010, the first-ever legal medical cannabis farmers’ market in the world, and the largest and most attended market of its kind. The market was featured on the cover of High Times Medical Marijuana magazine, and G4 TV‘s Attack of the Show! The market originally opened in Tacoma but moved to Seattle in 2013. The monthly enclosed market features medical cannabis and is free and open to all legal medical marijuana patients. The Cannabis Farmers Market has inspired others in Olympia and Seattle, Washington, and several other states. A similar event scheduled in Vancouver, Washington was cancelled in November 2012 at the request of local police. ^ This article uses the terms “cannabis” and “marijuana” interchangeably. No distinction is intended. ^ Both Washington and Colorado voted to legalize recreational cannabis on November 6, 2012, but the new laws took effect on December 6 in Washington and January 5 in Colorado. However, Colorado was the first state to allow retail sales. ^ a b Myers, Laura L. (December 5, 2012). “Marijuana goes legal in Washington state amid mixed messages”. Reuters. Retrieved December 3, 2017. ^ “Marijuana decriminalised in Washington state”. BBC News. December 6, 2012. Retrieved December 3, 2017. ^ Ingold, John (January 1, 2014). “World’s first legal recreational marijuana sales begin in Colorado”. The Denver Post. Retrieved December 4, 2017. ^ a b Camden, Jim (April 20, 2017). “Marijuana making its way around circle from legal to illegal to legal”. The Spokesman-Review. Retrieved November 20, 2017. ^ a b c d Caldbick, John (January 15, 2013). “Marijuana Legalization in Washington”. HistoryLink. Retrieved November 20, 2017. ^ Bonnie, Richard J.; Whitebread, II, Charles H. (October 1970). “The Forbidden Fruit and the Tree of Knowledge: an Inquiry into the Legal History of American Marijuana Prohibition”. Virginia Law Review. 56 (6). ^ Sanna, E.J. (2014). Marijuana: Mind-Altering Weed. Mason Crest. p. 88. ISBN 978-1-4222-9299-0. ^ Dills, Angela; Goffard, Sietse; Miron, Jeffrey (September 16, 2016). “Dose of Reality: The Effect of State Marijuana Legalizations”. Policy Analysis. No. 799. Cato Institute. Retrieved November 19, 2017. ^ a b Murphy, Kim (June 14, 1995). “Arrest Sounds an Alarm for Medicinal Marijuana Clubs”. Los Angeles Times. Retrieved November 21, 2017. ^ Alltucker, Ken (September 27, 1995). “Invalid search warrant lets McKee off”. Kitsap Sun. Retrieved November 21, 2017. ^ Ostrom, Carol M. (May 29, 1995). “Selling Just What Doctor Can’t Order — Trial To Test Backers Of Marijuana As Medicine”. The Seattle Times. Retrieved November 23, 2017. ^ a b Jaywork, Kasey (June 29, 2016). “The Beginning and the End of Washington’s Wild MMJ Market | Seattle Weekly”. Seattle Weekly. Retrieved November 24, 2017. ^ a b Gerber, Rudolph Joseph (2004). Legalizing Marijuana: Drug Policy Reform and Prohibition Politics. Greenwood Publishing Group. pp. 108–109. ISBN 978-0-275-97448-0. ^ “Elections Search Results”. Washington Secretary of State. Retrieved November 24, 2017. ^ a b “Washington State Medical Use of Marijuana Act”. Initiative No. 692 of February 26, 1998 (PDF). Retrieved November 26, 2017. ^ Green, Sara Jean (October 3, 2008). “State rule clarifies 60-day supply of medical marijuana”. The Seattle Times. Retrieved November 26, 2017. ^ a b Martin, Jonathan (September 18, 2011). “Medical pot OK in Seattle, in trouble in Spokane”. The Seattle Times. Retrieved November 27, 2017. ^ Schrader, Jordan (April 30, 2011). “Gregoire vetoes most of pot bill”. The Olympian. Retrieved November 27, 2017. ^ Myers, Laura L. (November 15, 2011). “Feds raid Washington state medical marijuana dispensaries”. Reuters. Retrieved November 27, 2017. ^ Sanders, Eli (December 8, 2005). “After I-75”. The Stranger. Retrieved November 27, 2017. ^ “Tacoma likes low priority on pot enforcement”. The Seattle Times. November 8, 2011. Retrieved November 27, 2017. ^ Barreto, Matt; Christopher, Parker (May 24, 2010). Issues and Opinions May 2010 (PDF) (Report). The Washington Poll. Retrieved November 29, 2017. ^ Kover, Justin (March 17, 2010). “Sign Initiative 1068 to put marijuana legalization on fall ballot”. The Olympian. Archived from the original on February 4, 2013. Retrieved November 30, 2017. ^ Johnson, Gene (July 1, 2010). “Pot initiative won’t qualify, backers say”. The Seattle Times. Retrieved December 2, 2017. ^ Initiative No. 502 of July 8, 2011 (PDF). Retrieved December 2, 2017. ^ Holden, Dominic (June 21, 2011). “Legalize It”. The Stranger. Retrieved December 2, 2017. ^ “I-502 offers smart path to marijuana legalization”. The Spokesman-Review. December 28, 2011. Retrieved December 2, 2017. ^ Connelly, Joel (September 17, 2011). “State Dems: Legalize marijuana”. Seattle Post-Intelligencer. Retrieved December 2, 2017. ^ Martin, Jonathan (May 2, 2012). “Sixteen state lawmakers endorse marijuana-legalization initiative”. The Seattle Times. Retrieved December 2, 2017. ^ a b c Martin, Jonathan (October 4, 2012). “Little organized opposition to marijuana-legalization initiative”. The Seattle Times. Retrieved December 2, 2017. ^ St. Pierre, Allen (February 17, 2012). “Endorsed: NORML Supports Marijuana Legalization Initiative in Washington State”. blog.norml.org. NORML Board of Directors. Retrieved December 2, 2017. ^ “NAACP Endorses WA’s Marijuana Initiative”. The Snohomish Times. August 27, 2012. Retrieved December 2, 2017. ^ Camden, Jim (October 30, 2012). “Opposition to I-502 low on funds, outreach efforts”. The Spokesman-Review. Retrieved December 3, 2017. ^ Holden, Dominic (March 7, 2012). “Pot Activists vs. Pot Activists”. The Stranger. Retrieved December 3, 2017. ^ “November 06, 2012 General Election Results”. Washington Secretary of State. November 27, 2012. Retrieved December 3, 2017. ^ Martin, Jonathan; Seattle Times staff (November 6, 2012). “Voters approve I-502 legalizing marijuana”. The Seattle Times. Retrieved December 3, 2017. ^ “Liquor Control Board statement following passage of Initiative 502” (Press release). Olympia: Washington State Liquor Control Board. Retrieved December 3, 2017. ^ Dennis, Brady (August 29, 2013). “Obama administration will not block state marijuana laws if distribution is regulated”. The Washington Post. Retrieved December 3, 2017. ^ Camden, Jim (November 16, 2013). “State taking applications for marijuana licenses starting Monday”. The Spokesman-Review. Retrieved December 3, 2017. ^ Johnson, Kirk (July 8, 2014). “Sales of Recreational Marijuana Begin in Washington State”. The New York Times. Retrieved December 4, 2017. ^ a b “DEA Briefs & Background, Drugs and Drug Abuse, State Factsheets, Washington State”. U.S. Drug Enforcement Administration. February 2005. Archived from the original on July 29, 2005. Retrieved December 17, 2017. ^ Solomon, Chris (November 25, 1998). “Smell Of Money Makes Pot A Big Indoor Crop”. The Seattle Times. Retrieved December 17, 2017. ^ a b Camden, Jim (October 18, 2009). “Sophisticated pot fields a growing problem in Washington”. The Spokesman-Review. Retrieved December 17, 2017. ^ a b Harris, Amy (August 23, 2011). “Marijuana growers find cover on tribal lands”. The Seattle Times. Retrieved December 17, 2017. ^ Jenkins, Austin (November 21, 2017). “Illegal Marijuana Grows Continue Even In Era Of Legalization”. KUOW. Retrieved December 19, 2017. ^ Rodriguez, Carrie (December 1, 2017). “Police seize $80M worth of pot, execute 50 search warrants, several in Bellevue”. Bellevue Reporter. Retrieved December 19, 2017. ^ a b c Hughes, Trevor (November 12, 2014). “Washington farmer offers a ton of legal pot for sale”. USA Today. Retrieved January 21, 2018. ^ a b c d e Cannabis Regulation: Lessons Learned in Colorado and Washington State (PDF) (Report). Ottawa: Canadian Centre on Substance Abuse. November 2015. ISBN 978-1-77178-293-7. Retrieved January 21, 2018. ^ Young, Bob (October 3, 2017). “Washington considers the sticky politics of homegrown pot”. The Seattle Times. Retrieved January 21, 2018. ^ a b “Monitoring Impacts of Recreational Marijuana Legalization: 2015 Update Report” (PDF). Olympia, WA: Washington Office of Financial Management. January 2016. Retrieved February 4, 2018. ^ Wells, Jane (February 11, 2015). “Washington has more pot than it can smoke”. CNBC. Retrieved January 21, 2018. ^ Wilson, Conrad (January 30, 2015). “Washington’s Pot Supply Is Driving Down Price”. Oregon Public Broadcasting. Retrieved January 21, 2018. ^ Lewis, Mike (January 9, 2017). “Pot sales reach new high of $1.1 billion in 2016”. KIRO-TV. Retrieved January 21, 2018. ^ “Marijuana Dashboard”. Washington State Liquor and Cannabis Board. 2017-10-31. Retrieved 2018-01-30. ^ Gutman, David (January 21, 2017). “Is marijuana money the answer to fund Washington schools?”. The Seattle Times. Retrieved January 21, 2018. ^ Santos, Melissa (June 29, 2017). “Where does Washington’s legal weed money go? A breakdown”. The News Tribune. Retrieved January 21, 2018. ^ “2015-2016 National Survey on Drug Use and Health: Model-Based Prevalence Estimates (50 States and the District of Columbia)” (PDF). Substance Abuse and Mental Health Services Administration. 2017. Retrieved February 4, 2018. ^ “2016 Washington State Healthy Youth Survey” (PDF). Washington State Department of Health. Retrieved February 4, 2018. ^ Cerdá, Magdalena; Wall, Melanie; Feng, Tianshu; Keyes, Katherine M.; Sarvet, Aaron; Schulenberg, John; O’Malley, Patrick M.; Pacula, Rosalie Liccardo; Galea, Sandro; Hasin, Deborah S. (December 27, 2016). “Association of State Recreational Marijuana Laws With Adolescent Marijuana Use”. JAMA Pediatrics. 171 (2): 142. doi:10.1001/jamapediatrics.2016.3624. ^ McNerthney, Casey (August 17, 2007). “Where there’s smoke, there’s Hempfest”. Seattle Post-Intelligencer. Retrieved February 15, 2018. ^ Nierenberg, Jacob (August 15, 2016). “Hempfest approaches 25th anniversary, but financial outlook is hazy”. The Seattle Times. Retrieved February 15, 2018. ^ Young, Bob (February 27, 2011). “Seattle’s first cannabis farmers market attracts several hundred Sunday”. The Seattle Times. Retrieved February 15, 2018. ^ “Tacoma Cannabis Farmers Market”, Farmer’s Market Online, retrieved 19 Feb 2013. ^ “About Us”, World Famous Cannabis Farmers Market, retrieved 19 Feb 2013. ^ Drew, Kristen (October 6, 2013). “World-famous Cannabis Farmers Market reopens in Seattle”. KOMO-TV. Retrieved February 15, 2018. ^ Shopping Spree at Seattle’s Cannabis Farmers Market, 20 Apr 2011, retrieved 19 Feb 2013. ^ (11/29/2012) “UPDATE: Farmers market for medical pot canceled”, The Columbian. Retrieved 1/27/2003. ^ (2/27/2011) “Seattle’s first cannabis farmers market attracts several hundred Sunday”, Seattle Times. Retrieved 1/27/2013. ^ (05/25/2011)“Wallingford’s Cannabis Farmers Market”, KUOW. Retrieved 1/27/2013. ^ “Free cannabis given out at farmer’s market”, Fox News 10. Retrieved 1/28/2013. Barcott, Bruce (2015). Weed the People: The Future of Legal Marijuana in America. Time. ISBN 978-1-61893-421-5. Gerber, Rudolph J. (2004). Legalizing Marijuana: Drug Policy Reform and Prohibition Politics. Westport, Connecticut: Praeger. ISBN 978-0-313-36167-8.